We do all the work - you save a lot of time & money! 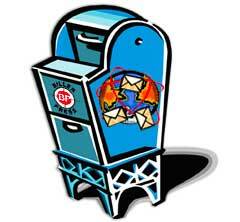 Process your mailing list using special software certified and approved by the Postal Service. Print the addresses and barcodes on your mailpiece. Sort the mailing in accordance with postal regulations. Bundle and tray the mailpieces in accordance with postal regulations. Deliver to the Post Office’s special bulk mail facility where they are inspected and then mailed. Why do all that instead of just dropping them into the mailbox? By preparing the mailing in accordance with Postal Regulations and submitting it as a bulk mailing the Post Office significantly discounts the postage rates.